This will be my last blog for the Preservation Department, not just for 2016, but going forward. 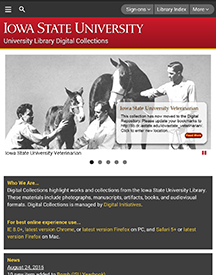 Earlier this year, my department (Digital Initiatives,) broke away from the Preservation Department and teamed up with Digital Repository to become a new department, DSI (Digital Scholarship Initiatives.) So… Good-bye old…hello new! I’ve been thinking a lot about this blog space and how I’ve utilized it during the years that I have been writing for it. Except for one, maybe two posts, they have all been about designing webpages and the challenges I have faced in creating them. I have to say I have learned as much about that process writing down my experiences as I have in creating the actual pages. Someone doesn’t really understand their position until they have to explain it to someone else. I haven’t always been good explaining my job to others, but the act of expressing those challenges on paper has allowed me to also teach myself, and in effect, become more confident of my skills. Sounds weird, but true. But that’s just the future as envisioned in November 2016. Who knows what more changes are in store. All I know for sure is that one must buckle in and get set for a fun-filled bumpy ride into the future. I know I’m going to enjoy it. I hope you have learned as much from reading my blog posts as I have from writing them. It’s been real. Thanks for tagging along with my adventures. So, lately, I have been working on a new page/site for Digital Initiatives that will eventually become the start page/site for a variety of digital sites under our department. 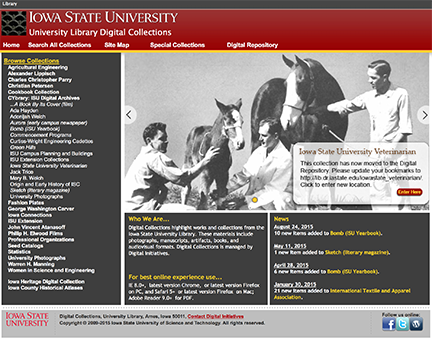 Currently, as you may remember, this is our start page: http://digitalcollections.lib.iastate.edu/. I cannot reveal the new start page, because we are still in the process of creating it. However, I thought I’d focus on one component of the page/site that we have not previously used before: forms. 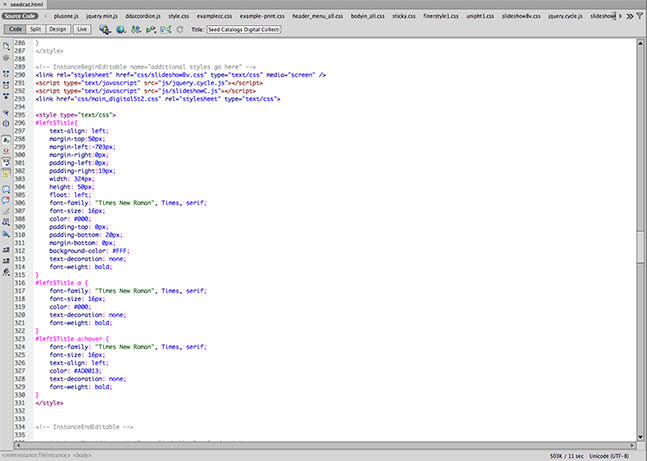 Now, before Drupal, forms were a pain in keister to create. But now, with a great support staff on hand, forms are super easy to build. Let me show you how. Forms are a part of Drupal that needs to be “turned on,” in order to work. In our set-up they are turned off to avoid confusion. Also, keep in mind, that once it is turned on, it is available on all pages you create within your site. When it does get turn it on, the magic begins. I created a Test page to show you how to create a form and how forms work. 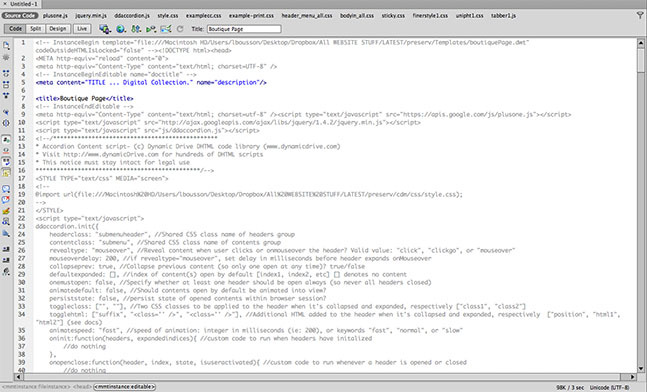 It’s very similar to a non-form Drupal edit page, except for the tab just to the right of Edit says Webform. There are five different sections under the Webform. 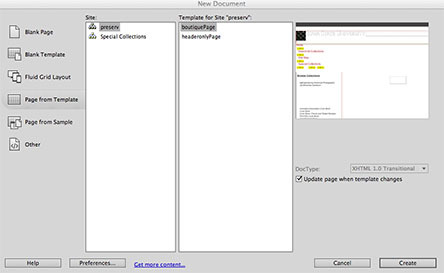 The first one, form component, is where you add the important parts of the form being created, such as a person’s name, email, address, connection, and comments. Let’s create a super simple form, which includes person’s name, email, an additional textfield for funnsies, and a comment box. First, we’ll click inside the “New component name” box, and type Name. The type is Textfield, so we’ll leave that. Now, click on the “Add” button. Note: this is only a partial screenshot of the page that comes up. Scroll down the age to look over the other boxes you can use to manipulate this info, including making this box a required value. A required value is a value that is needed to proceed. A red star will show up next to the label. Also, on these required fields, I place in parenthesis (required). [I have recently learned that some colorblind users cannot make the distinction between red and black, so adding this helps.] Other fields that are worth looking at: Display. 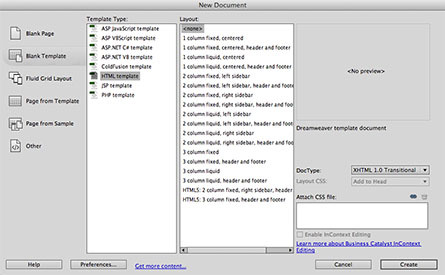 Here you can set the width of the component, add a placeholder in the box (like: myname@abc.com). Also check out the label display. Under this, you can change the label to be displayed above, inline, below the box; description can be displayed above the field; disable the field completely, or make it private, so only users with access can view the results. These preferences can be found on most of the component pages. For now, nothing else is needed, so scroll all the way down and click “Save component” at the bottom. Oops. I made a mistake. I forgot to label email “Email (required)”. No sweat. Just click on “Edit” beside the Email label, and on the next page, change the title in the label name. Scroll down and click “Save component”. Now, let’s add another textfield. Here, I’m going to get goofy to show you different things you can do with the form. In this window, check to make sure “Required” is ticked. I made the Display width 75; I added a Placeholder (to be shown inside field until user starts typing); I Prefixed the textbook with craziness, and Postfixed it with more craziness. Finally, I placed the Label Display to None. Let’s add the comment box now. Name it “More comments (required)”; choose textarea; make it “Required”; in the next window: make Validation “Required”; and make sure Resizable is ticked under Display; scroll down and click “Save component”. Notice that there is no red star anywhere near the “I’m glad” text field. This is something to be aware of, if you decided to hide the label. If any one of those red star areas is left blank, the user will not be able to move forward. OK? OK! Back under Webform, you can see there is a few more section to the right of Form components: Conditionals, Form validation, E-mails, Form settings. The ones to be most concerned with are E-mails, and Form settings. Let’s move over to Form setting. This page is a doozy, with many options to choose from; my advice: choose wisely, little grasshopper. These are all self-explanatory. Notice on the bottom under Next submission order. This number should be 1 if you have just created the form; otherwise the number will be whatever number is currently submitted for the form. One last note: To the right of the Webform tab is a Results tab. This tab shows the results from the form on the page. Of course, there isn’t much on here right now, but this page will list every form submitted by users, default setting is recently to oldest. Under Operations, will be additional links: View Edit Delete. You can either click on the number under #, or View under Operations corresponding to the number to see the actual submitted form. Drupal makes it so easy to create and maintain forms. I hope they are as helpful to you as they are for us. I spend a lot of my time on the internet. It’s a part of my job; usually I’m creating pages, updating, or creating new collections. But lately, I’ve been spending even more time on the web doing research. Our department, Digital Initiatives, has gone through some transitional changes since the first of the year. The biggest one being that we have a new (or, rather: permanent), director: Kim Anderson. She has some cool ideas of how she wants our webpages set up. 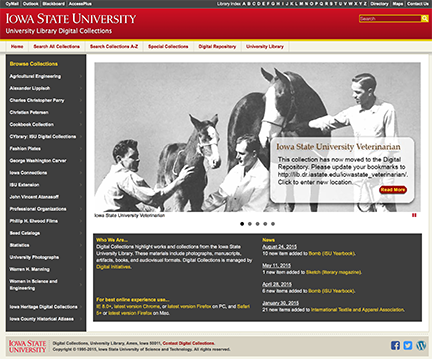 One idea, that she would like to see incorporated ASAP, is that she wants to have a layer over the top of our current page (http://digitalcollections.lib.iastate.edu/), that directs researchers to either our CONTENTdm boutiques/pages, or to other new pages/collections yet to be implemented. In addition, this main page will have, perhaps, the department’s pertinent information, (or links), as well: staff, tools used, mission statement. That sort of thing. So, here I have been: looking through and finding similar pages that we may find inspiring for the eventual page layout that we create. I broke it down into two sections, both real-life examples: a “tools” page (which we’d like to create that shows our researchers what we used, both applications wise and equipment wise): and a new “Digital Initiatives” page. Sounds easy enough, right? Well, you know nothing is easy in Lori’s world. Nut .’N. Honey. No, it’s not. I can now understand why Kim wanted to sicced this little gem of a project on me. Not only isn’t there much out there, but as I have been doing this, I have found that, by and large, there really isn’t a “standard” when it comes to describing what we do, and how it’s managed. It is hard to find separate pages within other academic libraries that demonstrate the importance of this distinction. 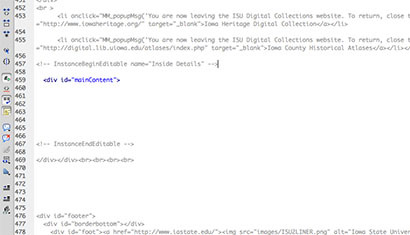 Since our school is in the Big 12, I’ve looked at all those library sites in search of other Digital Initiatives departments. (Sadly, only schools that made my list where two schools no longer in our league.) I’ve looked at hundreds of “Digital Initiatives” links. In addition, I’ve looked at hundreds of additional general academic library sites. There are only about a good two handful of links that I care to share with our director. Fifteen to be exact. The rest either consolidate it in with another departments, (Digital Repositories; Special Collections; IT;) or don’t even get mentioned at all. And of the ones I have listed, even some of those are a part of these other departments. 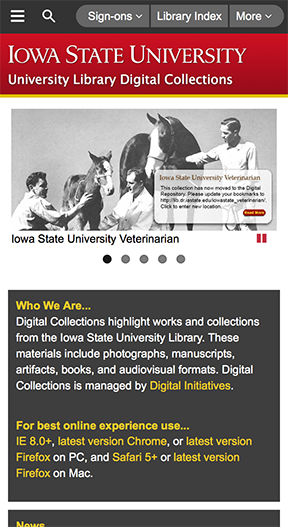 One university listed their digital collections as a part of their “slides” collections. Sometimes, they have a link to Digital Initiatives and that link sends the researcher to a CONTENTdm collections page. It was just like they were setting these pages up to be a regular library web page. 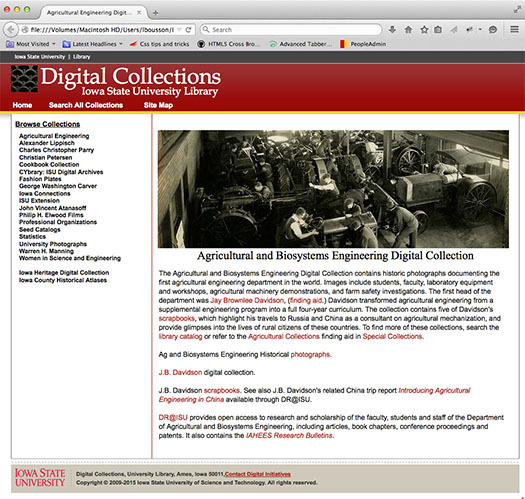 Digital Collections are like exhibit pages. 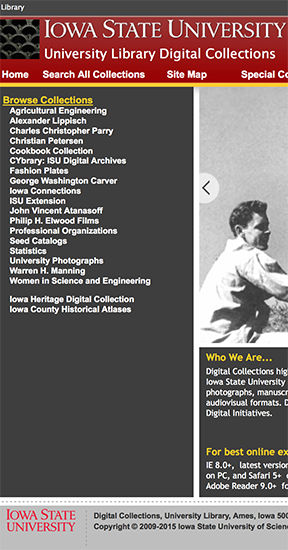 (We call our main collection pages, like: http://digitalcollections.lib.iastate.edu/charles-christopher-parry, boutiques.) I honestly believe that the most innovative digital exhibits are the ones that are easy to navigate; merge well with the items they are showcasing; and make learning fun and informative. This reminds me of a true work event that I was involved in back in my Tribune days. The paper there had the foresight to see “digital” papers were the coming thing. However, they didn’t have the foresight to involve enough knowledgable persons about the layout of such a site. They didn’t go to one of the composition designers to ask advice. Goodness knows, a designer would have a better understanding of layout. But no…they went to one of their coders who had a general idea of what webpages should look like, and had happened to take one class on web coding at college several years previous. In hindsight, if they noticed this at all, they would have been wiser to have had a collaboration between the coder and a designer. The web pages turned out to look very basic and were very un-intuitive about navigation. Long story short: yeah, email could take you to the webpage for the Tribune, but navigating to pages off the “cover” was a nightmare. The sections navigation made no sense and sometimes one had to jump through several pages to get to the article. I felt sorry for the coder. Person was doing the best they could. But that’s what I thought about when I was researching other library’s Digital Collection pages. I’m starting to see a pattern in my research. It boils down to this: academic libraries seem unsure, themselves, of exactly what Digital Initiatives entail. I’m not talking about the “in the trenches workers” (though there might be some of that too). I’m talking about Administration. Mostly, this pattern shows a lacking in understanding, and also how poorly forward thinking libraries have become in watching and implementing trends. Our department has been in place for well over eight years. We are modest in development, but the future looks bright for more robust collection developments. I believe we have a very passionate staff that understands digital collections, (although there is always room for growth and enlightenment)! I know that Digital Initiatives is a merging department. I’m lucky we have a Dean that understand this, and have a passionate director who has cool ideas for not only collections, but our department’s future. I am hopeful that with this new direction that we will not only exhibit digital collections, but that we will innovate and lead the way for Digital Collections departments in other libraries in the future. So, to recap to my previous adventure: I had just learned how to make sticky footers that worked with our pages. I maintain many pages (34, plus a home page) for our website, and they are not all the same length. We have boutique pages. We have thumbnail pages. We have boutique pages with a little image vs. big image at the top. We have thumbnail pages that are short vs. ones that are long. We have a page that has secret embedded code so if you know the super-secret key combination, an elephant will appear in a pink tutu and dance a jig. (OK, well, maybe we don’t have that last one… but wouldn’t it be fun?) The thing is, we have a lot of pages that all basically have the same wraparound: the header, the menu, the footer is all the same. It’s the “inside,” and the length of the inside that’s different from page to page. You can see we had a vertical header across the top, along with a vertical menu. Then on the left side, we had a horizontal menu, with links that go to our pages within the site. The footer followed below, with social media icons below that and to the right. The primary reason I wanted to move to templates is that updating 34+ pages individually can be overwhelming at times, even if all you’re doing is copying and pasting. I thought knowing how to create templates might make it easier to maintain the pages. 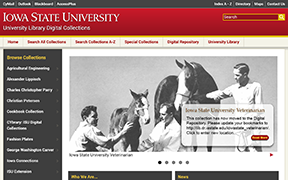 I got my first chance when I was working on re-designing the Special Collections web pages; all their pages are template-centric. I thought it should be pretty easy to figure out. It would be how I usually figure things out: a combination of Firebug and reserve engineering; but digging through code, I had an issue with wrapping my brain around how to write the thing. That was frustrating! I went back to my old standby of research; studying; reading. Looking at a made template can be quite confusing. It doesn’t seem logical that it could work. And indeed, my first few attempts were ugly. I’m even embarrassed to say that I might have accidentally messed up the main Special Collections’ old template in trying to figure out how to get the templates to create correct layouts. 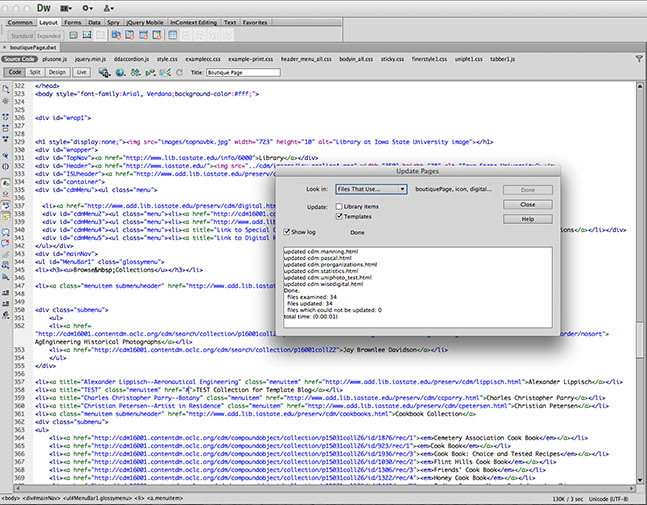 Open Dreamweaver, if not open already. I use Dreamweaver CS6. 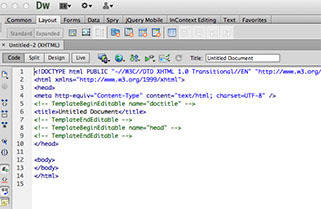 Create and design a html page: File—>New…—>Blank Template. Select HTML template. I just selected <none> for Layout style, but the choice is up to you. This is what a blank DW template doc looks like. will stay editable. Everything outside of that section will be locked into the template. So, everything that you want to stay the same in every document MUST BE OUTSIDE THE GREEN <!— Template…Editable —> sections. I cannot stress this enough. This is a very important point to remember. Add additional <!— Template…Editable —> sections as needed. Don’t be shy creating these sections, but don’t go cray cray either. I added one for additional styles and another one for my inside details, and third one for stat counter code at the bottom of the page. (I used the auto generated head section for my Google Analytics stats, but I also keep stats through StatCounter, and that requires different code for each page.) So, I created three additional <!— Template…Editable —> sections. The ones I listed are probably the most you really need to add. Remember, you only need these sections for code/html that you want to be able to change individually on pages, not universally. When you go to name your template page, use a name that anyone can clearly understand. I named mine boutiquePage. The page will save with a .dwt. This is the page you will open up and edit when you want universal changes across all your template-based pages. Another dialog box will pop up and give you an update. Click Done or Close button (which ever one applies,) to dismiss the dialog box. Old documents tied to this template (and new ones created after,) will now contain this update. Once you have made the change to the template, and saved/updated the other documents, you will need to upload all affected pages again to your server. We’ll explore making new documents and changing certain elements with those new documents for my next blog, slated for July 21, 2015. Until then, happy coding, and may HTML forever be in your favor.